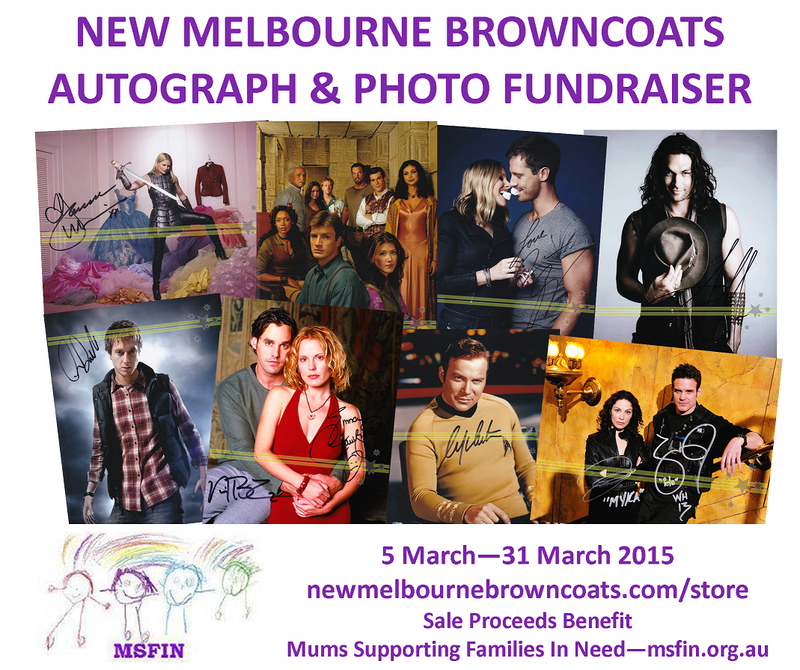 New Melbourne Browncoats, Inc. | We’re having a massive Autograph sale for charity! We want your opinion on our plans for Serenity’s 10th Anniversary! We’re heading to Supanova Melbourne AND Oz Comic-Con Perth on April 11-12! We’re having a massive Autograph sale for charity! Our latest fundraiser features a great range of autographs from some of your favourite celebrities, as well as unsigned Whedonverse photos and prints. Sales benefit Mums Supporting Families in Need (MSFIN), who provide quality second hand material aid such as cots, bassinettes, carseats and prams for babies; clothing, shoes, linen and new toiletries for all ages as well as toys, books, new nappies & wipes and other baby essentials to families throughout Victoria in circumstantial crisis. You can learn more about MSFIN at www.msfin.org.au. The MSFIN fundraiser ends on 31 March 2015. Click on the Store link to check out all the shiny things up for grabs! Please note that sometimes the store may be a bit slow to load, so please be patient. All prices are in Australian dollars. Payment is via Paypal checkout, and shipping is available worldwide. All sales are final, and no refunds will be given so please choose carefully. Special thanks to Oz Comic-Con/Hub Productions, Gifts for the Geek, and the generous individual donors who have enabled this fundraiser to take place.